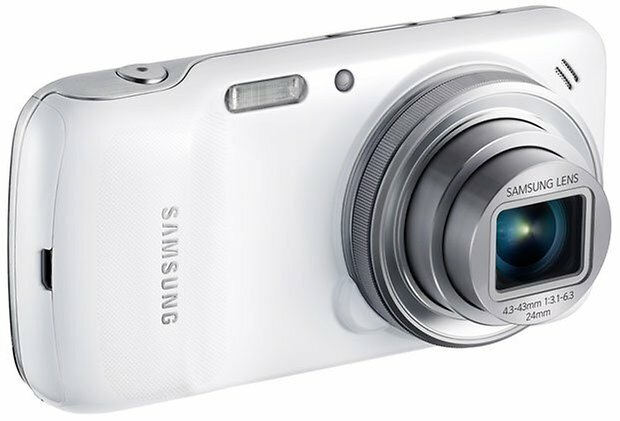 The Galaxy S4 Zoom is a a powerhouse of a smartphone with a camera complex. The camera-phone weighs about 200 grams and is about 15.4 millimteres thick - if the camera lens is not extended. Everything included, the user gets a compact camera with 10x optical zoom which also doubles as a smartphone. Pricing and launch date still haven't been confirmed, but are expected within the next little while. Samsung has a CMPOS sensor installed in the S4 Zoom with 16 megapixels. This is supported by a xenon flash and a lens with 10x optical zoom. Included as well is an optical image stabilizer for movement, to help reduce blurriness in photos when they're taken. The key points of of the camera (ISO, Focal Length, Aperture) are on par with most point-and-shoot cameras and are pretty standard fare. A secondary front facing camera is always present at 1.9 megapixels and supports video chats. On the back of the phone, is of course, the display which takes up the majority of the space. It's 4.3 inches tall and has a 960 x 540 resolution. Samsung has backed the S4 Zoom with AMOLED technlogy which provides good colour and contrast but that can be a little harder to see in a bright environment. The dual-core processor is clocked at 1.5 GHz with 1.5 GB of RAM inside which provides sufficient power to operate the system. The battery also comes pretty well equipped at 2330 mAh and internal storage is set at 8GB (with microSD expansion possible up to 64GB). 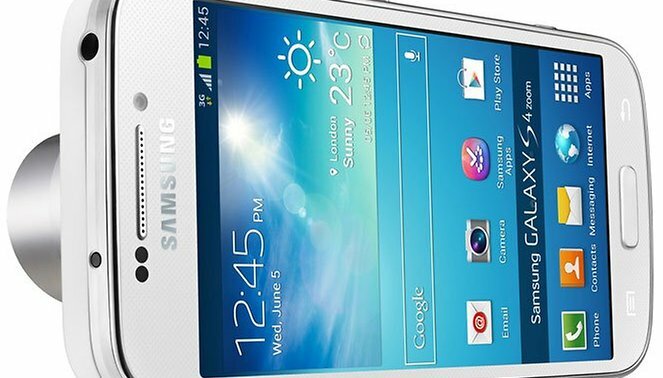 Android 4.2 will be installed on the Galaxy S4 Zoom along with Samsung's ToouchWiz. It comes with some additional features specific to the S4 line of devices: S Voice (voice assistant software) and S Translator (translation software). Also, some specific photo software is also included. There are a some multiple presets for the camera, including Smart Mode and editing software so that you can do some editing on the fly. An additional feature that will be unique to the S4 Zoom will be the Zoom Ring around the lens of the camera. If you turn it while during a call, for example, you can quickly snap a photo and send it without having to access any other menu or app. Unlike it's predecessor, the Galaxy Camera, the S4 Zoom can actually make calls. It has micro-SIM capabilities and supports all the current radio frequencies: GSM, EDGE, HSPA, and even LTE. Of course, Wi-Fi and Bluetooth 4.0 will be on board as well. Now here likes the crux. As a smartphone, the S4 Zoom is pretty hefty. It's dimensions are 125 x 63 millimeteres and while it's not as high or wide as the Galaxy S4, it is 15.4 millimeters thick. Sure, it fits into most jacket and shirt pockets, but when put into your pant pocket, it feels like a little lead weight coming in at 208 grams.